The first books that I loved to read were the Trixie Belden mystery series written by Julie Campbell Tatham. It was the summer of 1968 when I was introduced to the series through a friend of mine. After I read the first one, I wanted to read them all. But that was easier said than done. The only store that I could buy them for myself did not carry the entire series of fifteen books. It was hit and miss whenever a new shipment of books came in. Sadly for me, it was mostly miss. Another one of my favourite book series was ‘Cherry Ames, Student Nurse’. This was about a young woman who trains to become a nurse just as the Second World War is about to break out. Subsequent books chronicle her nursing adventures in the years that follow, including the discovery of penicillin. Several years back, I attended a ‘pinning ceremony’ for my daughter just days before she received her degree as a registered nurse. The guest speaker spoke at length about how she also read the Cherry Ames series of books when she herself was a young girl. It was this series of books that inspired her to become a nurse. She is currently head of nursing in one of Toronto’s major hospitals. This was an incredible lesson for me on the positive power of books in a young person’s life. Last month, I found a Trixie Belden book on a used book counter. 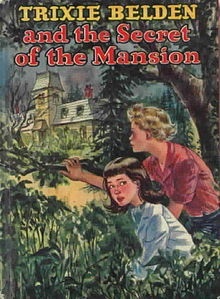 As I read the back of the cover, imagine my glee when I realized that this was one of the few elusive Trixie Belden books I had not been able to find as a girl. I’m sure that Trixie is still the curious, mischievous little sleuth that she was in 1968, and that her neighbour and best friend Honey is still as lovely as ever. However, it is truly a lifetime since I’ve last visited them. I am much older now and have two grown daughters of my own. Hence, hopscotch and jumping rope are no longer my forté. I look forward to seeing them again very soon. I hope they recognize me.